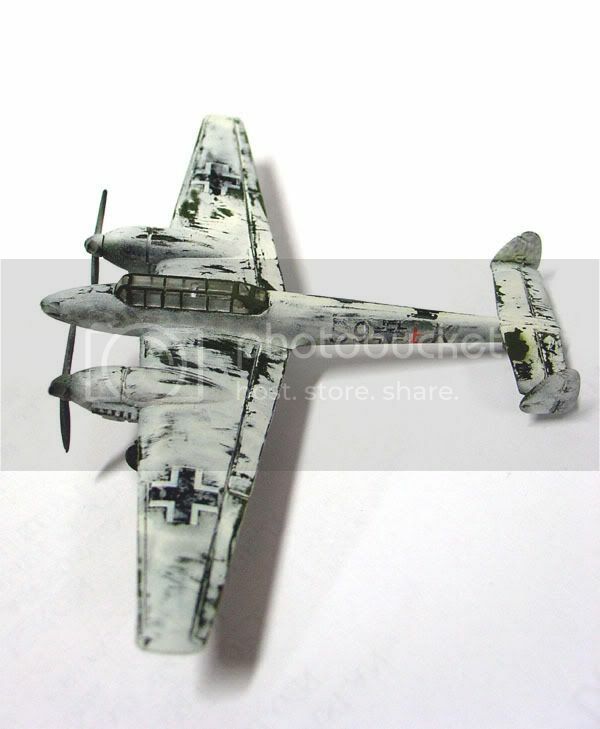 Just wondering how many of us out there are die-hard 1/144th scale builders ? Whether you build Aircraft, Armor, ships, or whatever, sound off Gang ! I know there has to be a bunch of us, and the list is growing ! We're getting more and more each day, so let's help each other. Hmmmm...... There must not be very many out there. 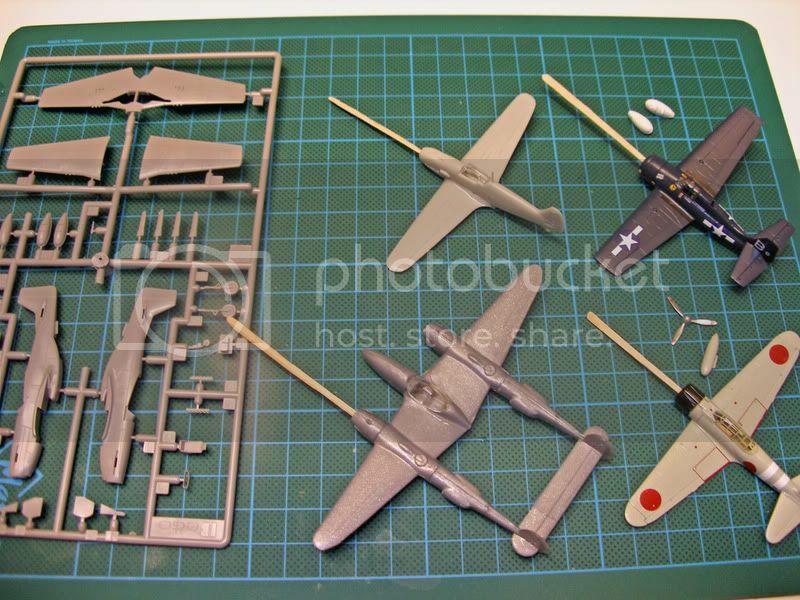 I "dabble" in the scale as well, having picked up a number of the DML aircraft kits. I like the kits, they seem well enginered for the most part. However, at my age (55), eye-strain does come into play, so these kits are quick-build amusements, rather than serious modeling attempts. Whew ! I was starting to wonder if there were any 1/144th builders out there ! Actually, this scale has really taken off in the last few years, between Aircraft, Armor (growing), and now ships slowly starting. What I love about the scale is the fact it will not kill your display space plus definitely it is not a budget-buster. With the growing competition between Revell and Dragon, with Trumpeter trying to decide to join in or not, it will be interesting in the future. Mike, don't feel bad....I'm 57 , and the eyes aren't as good as they used to be. I use "reading glasses" (3.50 magnification) to help out. I too have dabbled in the 1/144th scale, in the interest of space conservation, when tackling larger subjects. I have even dropped down to 1/200th in a couple of cases. But I do prefer 1/72nd scale as my primary. This display is 1/144th scale and still 11 x 14 inches. As to the eyesight issue, like Bruce, my sight needs assistance as well. I do all my work regardless of scale under a magnifier light, with my glasses on. Hell, I need my glasses to find the magnifier light. I must be a bit strange. I need glasses to drive and watch telly eyc, but recently i've found i can't focus close up with them on. Andy - don't think of it so much as close up work, but more as getting things big enough to see what you are doing. At least that is the case for me. I just started working in this scale, mainly due to lack of space. Currently working on a project for the "Rumble in the far east" campaign (you can see more pictures there). I'll be doing a few more kits in 1/144 - they are really cute! 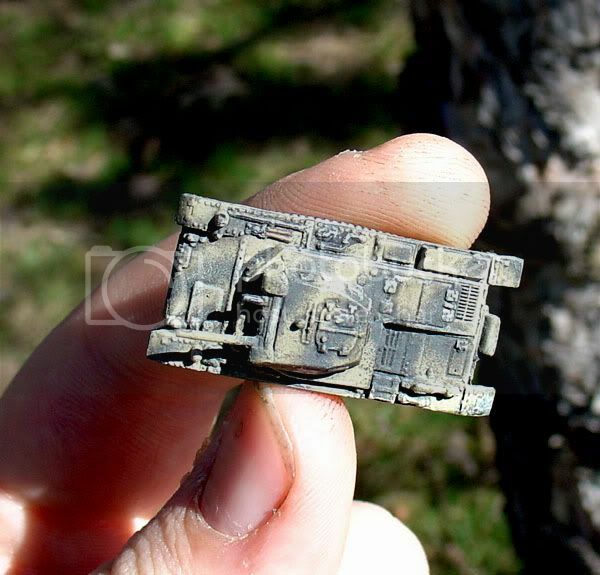 - but then I hope to step back up to the BIG scale (1/72, that is). I miss detalining cockpits! 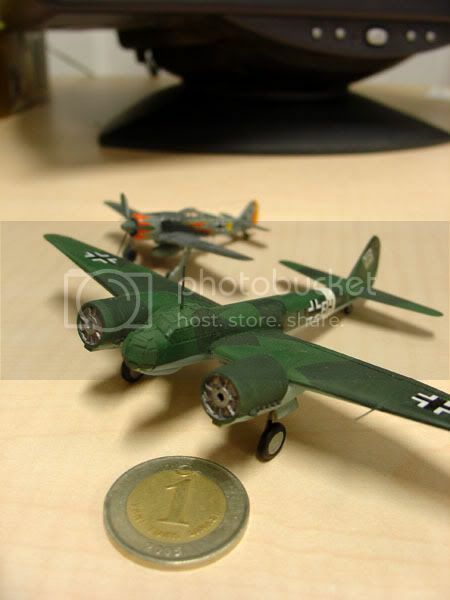 Any news regarding the P-47D Bubbletop that Platz is supposed to release soon? No argument about the quality of Sweet and Platz kits. But you might also find the new releases from Revell and Eduard are also right up there in quality. Eduard's 262 family is terrific. Also if you haven't seen them yet, the P-51B's from Sweet are top of the line with both the normal canopy and the Malcolm hood. I usually build in 1/32 and 1/48, so why bother with such small things as 1/144? I started when I couldn´t decide between two paint schemes on a Academy 1/32 F/A-18C Hornet kit. I bought two small (and cheap!) Revell 1/144 F/A-18´s, and I was suprised by the high quality of them. Then came the SWEET Hurricane MkI Fabric Wing and I bought a box, and was suprised to find TWO kits in there! Fit, detail and decals were fantastic so I got the Wildcat... and the Macchi C200... and the Bf109.... and the P-51B Mustangs..... and are waiting for more to come! Fw190D-9, F-8 Crusader and are waiting for the Hellcat and Thunderbolt! You can build as many aircrafts you possibly want to, as they hardly take up any shelf space. You can build aircrafts variying in sieze from the Wildcat to the An124, and still be in the same scale. Now I admit that I do collect every new issue from SWEET, PLATZ, Dragon and Revell. Add to all this the old brands and It´s a quite big range you have to choose from. These small kits are easy and fast to build, making them the perfect diversion from more "serious" builds in the larger scales! Don´t forget: they are dead cheap considering what you get in the boxes (newly moulded kits that is!)! Obviously, I agree with your sentiments. Plus the most recent things coming out makes it even better. 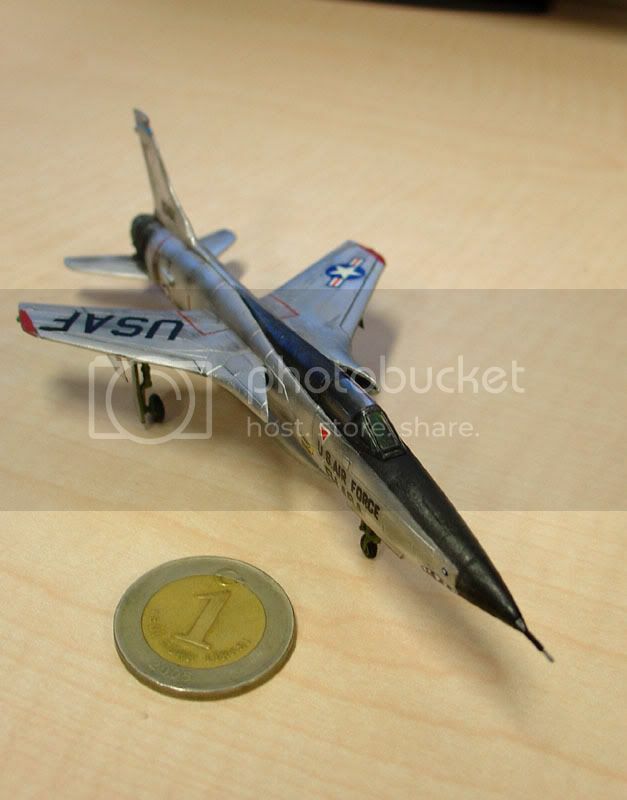 If you are a diehard aircraft modeler, armor modeler, or shipwright.......you can now branch out in our preferred scale without investing buckets of money. DML is popping Armor models faster than I can keep up, and Revell is doing their best with 1/144th Submarines. Besides the Type VII minelayer, there is the modern Type 212A, just now joined by the Type 214. Plus Trumpeter has also jumped in with the LCAC, Kilo Class Boats, etc. Overall, I have to say, 1/144th is definitely coming on. IMHO it is a Great scale and well worth modelers checking it out. How about an "Itsy bitsy" campaign here on Aeroscale for aircraft and aircraft dioramas in 1/144 or smaller? I've been thinking about it for a while. Maybe we can lure some people who has yet to try this scale? Please revert if you're interested. I definitely agree with you. Unfortunately I have way too much going on at present to host, but if another jumps in, I'll enlist. It is the best way to drum up interest and get a following going. As I've stated previously, there are more than enough extremely good kits on the market now, and 1/144th needs to be taken seriously. I've seen some really great models out there, and I keep trying on my own. P.S. Here's a little teaser to get us started....Eh ? Another 144th scale builder signing in. I have 2 of Sweet's P-51 B's here on the bench. I love these little guys! Thank GOD you get 2 kits in a box!! I have 2 of Sweet's P-51 B's here on the bench. ... and the "POW" kit of the P-51B has markings for two Swedish Aircraft! Is that your CF-18, Bruce? Mighty impressive!!! If we get a few more interested people, I'm going to submit a suggestion for an "itsy-bitsy" campaign. Heeey! You can't just built up a 144 thread without me!! That is illegal! 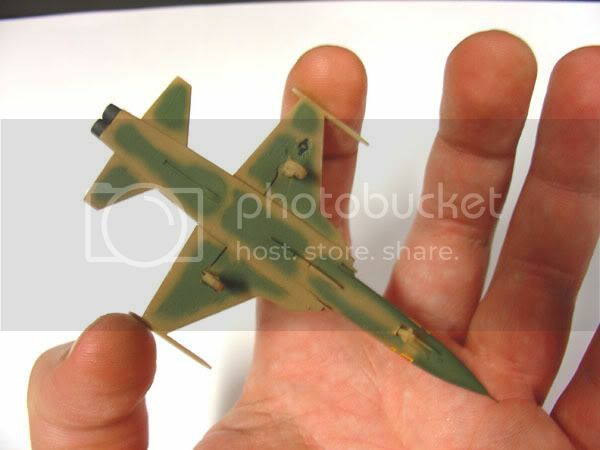 I love building 1/144 aircraft since I was a little kid. I simply love the scal.....hey!! wait a minute! Where did you find those figures???!!!!!!!! Anyways. I love building anything small, maybe that is why I build 1/144. I take it you want in on a possible 1/144 campaign! I ordered figures from www.ozmods.com. They have both seated and standing, WWII and modern. I hope their quality is good, but I can't vouch for it. The figure with the CF-18 looks like one from Preiser, who has at least two interesting sets in 1/144 (one modern and one USAAF). Anyone else interested in a campaign? Bjorn, I haven't seen the OzMod figures yet. Please let us know how they are when you receive them. OzMod have quite a few accessories available including bombs and missiles. My P.O.W. 's are goingto be German and Japanese. I've always liked the sharks mouth on the nose. A small-scale campaign would be great, of course I´m in on that! Bruce, you wanted to see some of our builds. Well, here´s some of mine! The Trumpeter Kawanishi H6K5 "Mavis", not a small plane even in this scale! Revell F-14A, From VF-142 "Ghostriders". 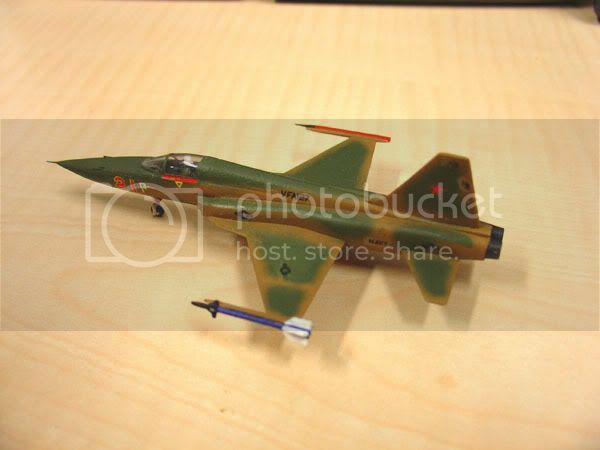 And this little Revell F/A-18C Hornet inspired me to do it in a slightly larger scale! My stable of "Ponies" (P-51´s) can be found here on Aeroscale! Hope you enjoyed my small kits! Very nice work, Thanks for posting these photos. Come on, crew.....everyone just post 1 or 2 photos. That will serve to introduce ourselves, and generate some Great interest in our hobby. Remember, we have to help each other out to grow the hobby. And especially you, Penny, we have so few women in this hobby. So don't anyone be bashful. Post a photo and ask for assistance if you need it. I have no doubt someone on this list will have the answer ! At present, I'm finishing a Scratchbuild PBR (Patrol Boat River) from Vietnam for Modelshipwrights. Plus I'm also working up a Trumpeter AAV7A1 USMC vehicle, and of course the Minicraft C-130. Here's a Sweet FM-2 Wildcat that I build. This kit came with the kitty figures and the deck. I upload my birds from time to time but why not post here too? But beware, I realy can't finish them as clean as you guys(and ladies). This is my latest finished one. Arii's reissue F-105. Cute kit, but a total lie on the decals and instruction. So I improvised the decals from other kits and finished as a probable but not existing plane. 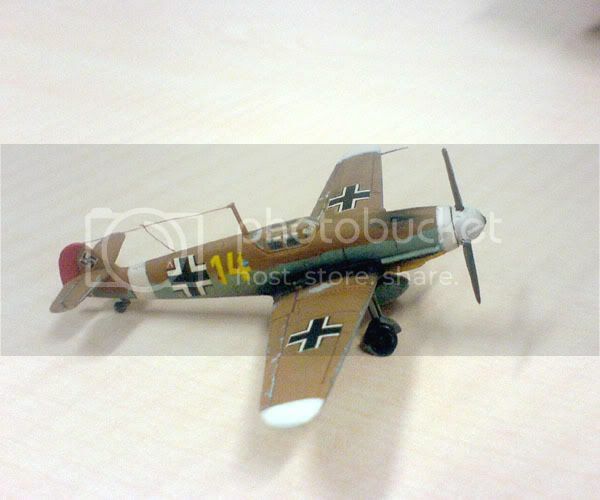 This is my first Bf.109 in the "True Scale" Quiet a disaster actually. 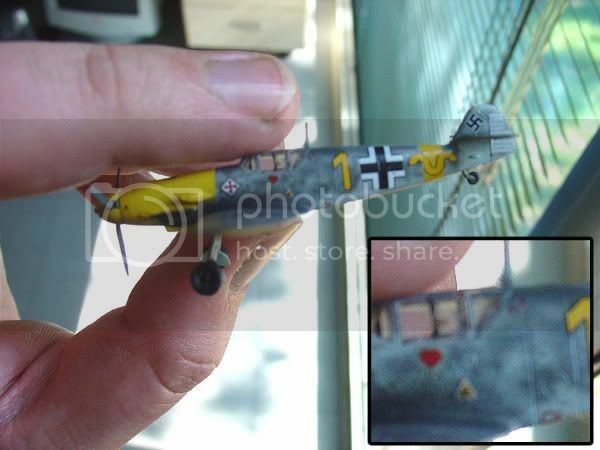 Minicraft Bf.110. I tried winnterwash. 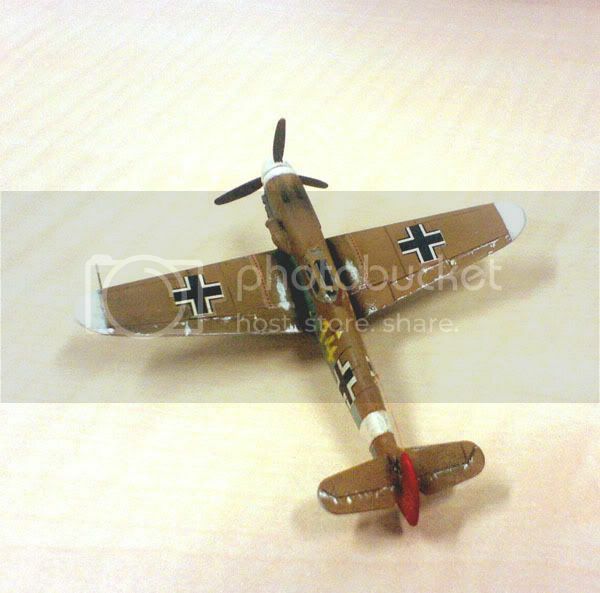 Also Minicraft Ju.88A-4 astill not finished, acompanied by Eduard Fw.190 A5 of Hermann Graf. 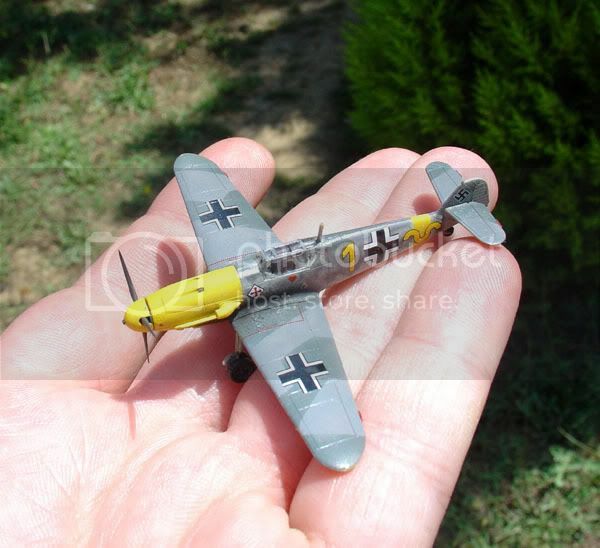 Sweet little Bf.109F-4. To be honest I am pretty happy with it. Still needs an anthenna though. Thank you for posting photos, it's good to see other's work, gives all of us ideas. And since we're showing different company's products, what company's do you feel are producing the best 1/144th kits at present ? For "Mainstream" kits, I have to vote for a heck of a contest between Revell and Dragon. But if Eduard really get serious....look out ! For the smaller companies...... hands down it has to be Sweet.